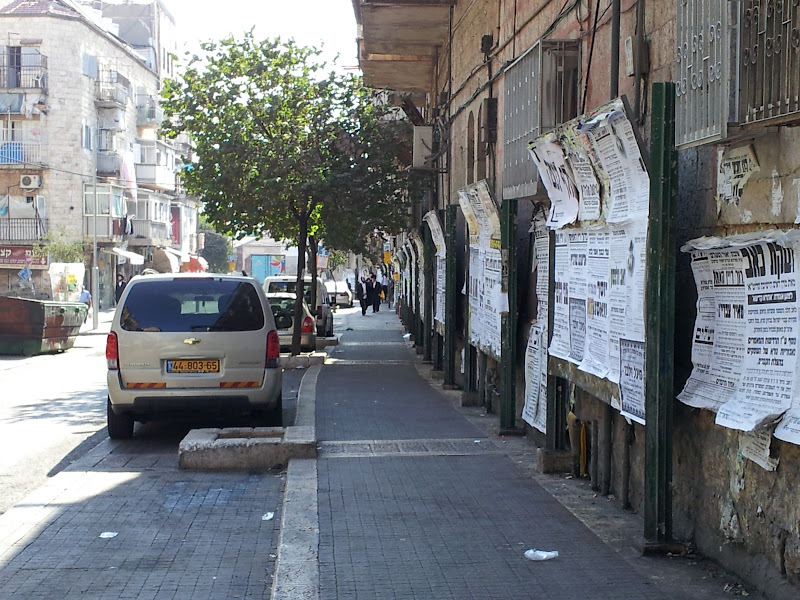 Shearim: Where to go in Jerusalem during Sukkot ? The Jewish world is celebrating its Sukkot and thousands of visitors have been streaming to Jerusalem. In the days of the First and Second Temple it was a great Mitzvah going up to the Temple Mount, to the Beit HaMikdash, and sacrificing the Korban Chagigah. Even the non - Jewish world went up to the Temple during Sukkot and brought sacrifices. Today, the Mitzvah for the Jews still remains and thousands are visiting the Old City these days. Furthermore, there are about 6000 Christans from abroad visiting the capital but mainly for missionary reasons. In fact, the entire "Jerusalem Parade" taking place this Thursday is a missionary event organized by the vicious Christian Embassy located in Jerusalem. No wonder that Mea Shearim keeps on putting out warnings all the time. What is there to do for Jews in Jerusalem during the holiday of Sukkot ? First of all, the BIRKAT HA'COHANIM taking place during Shacharit tomorrow morning. Nevertheless, the Jewish Quarter will be totally packed and in case you are hungry or thirsty, make sure to eat before showing up and buy your drinks in the New City because the Jewish Quarter will be a rip - off for many purses. As a matter of fact, most visitors are going to stream into the Old City where plenty of events are taking place. Among others, the free trips organized by Yeshivat ATERET COHANIM. The Yeshiva students will take you through the Arab and Christian Quarter of the Old City in order to show you where Ateret Cohanim bought houses from Arabs and turned the property into Jewish homes. Today there are quite a few religious Jews living in the middle of the Arab and Christian Quarter. Protected by private security companies as well as the Israeli Border Police. Those trips are in HEBREW only ! Sukkot is a holiday where Israelis love to make nature trips. Thus the Dead Sea, the beaches at the Mediterranean and nature parks are going to be crowded. Shopping Malls offer many attractions to the kids and the entire country is enjoying the Chag. Religious Jews are drawn to Mea Shearim where almost every night, the huge Simchat Beit Ha'Shoeva celebrations are taking place. Many Synagogues are closed to the wider public, as the members take up all the space during Sukkot. However, there are still places where everyone can go. Squeezed in but, at least, something. MOADIM le'SIMCHA - A great Sukkot to all of you !